From bottles and bottle cages, indoor trainers and rollers with new levels of realism, to the Ozone-Elite performance creams, Elite continues to offer discriminating cyclists new products that enhance the cycling experience. A few simple things can help you enjoy your riding even more… Using chamois cream on longer rides will help reduce chaffing and keep you comfortable for longer. Rubbing in warming oils on cold morning starts or pre-race helps to get everything ticking over quicker and prevents injury. Suitable for various sports, not just cycling, these products have been created for both men and women alike. Used by our staff and our CycleLab ‘Cross team we can not recommend them highly enough. 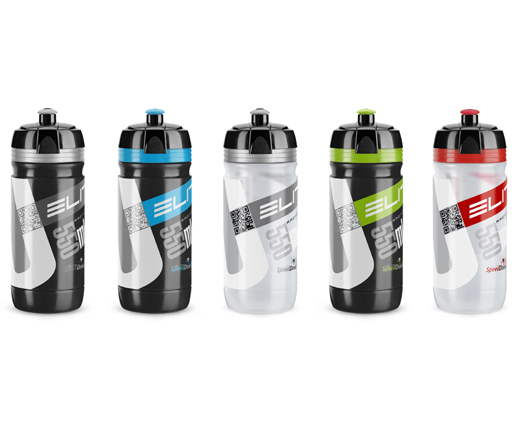 We stock various bottles from Elite but the entry level Corsa is a firm favorite. Available in various colours and 3 sizes – 550, 750 and 950 ml – they’re made from food-grade squeezable biodegradable & BPA free polyethylene… Whats not to like!